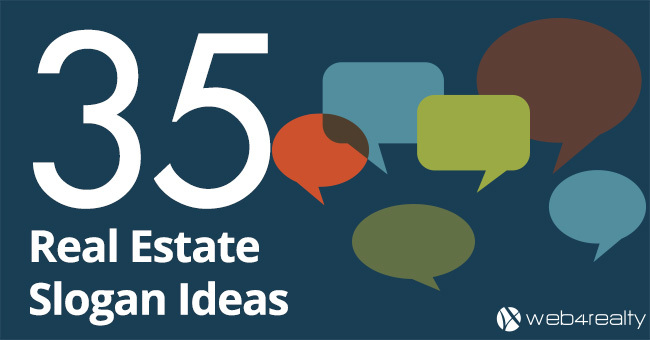 How many real estate trascations are you looking to close in the next twelve months? Eight? Fifteen? In today’s podcast, Kosta interviews Cynthia Ostos, a Top Agent is Mississauga who is aiming for one hundred transactions a year. Cynthia became a real estate agent back in 2010, when she was thirty years old, and in just a couple of years, she was able to average twenty five transactions a year. To put that number in perspective, the average real estate agent closes between six to eight transactions a year. Cynthia claims that when she first started working as a realtor, she was simply “winging it”, but still managed to sell four times as many properties as the average realtor. Cynthia tells us that her success was due in part to her laser-like focus on “just one thing” at a time. Every real estate agent has a lot of plates to juggle at the same time, and it can be easy get distracted by every new and shiny trend. Cynthia stresses the importance of becoming an entrepreneur who treats their real estate work as a business. No matter how skilled a successful real estate agent may be, eventually they hit a productivity ceiling. Because there’s only so much a can do in a day, a successful realtor needs to learn how to leverage their time in order to grow. As Cynthia puts it, “leverage is the new hustle”. After hitting a forty transactions a year ceiling, Cynthia decided to start her own real estate team. The Cynthia Ostos Real Estate Team now includes a sales representative and a communications and events coordinator, and they plan to reach their one-hundred transactions a year goal this year. 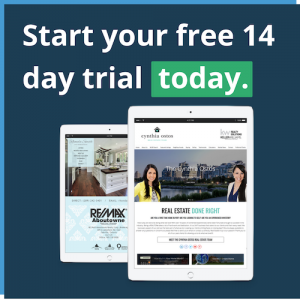 Cynthia and her team have a strong online presence, and put a huge emphasis on promoting their listings to the max, particularly through video content. Whether you’re a new real estate agent, or a well-established veteran, you really don’t want to miss this podcast. 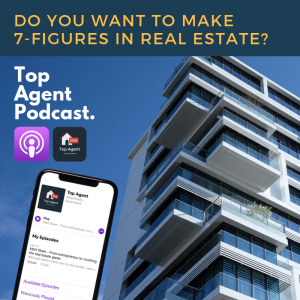 Check out the podcast or read through the interview’s transcript below at your leisure, and start becoming a Top Agent today. 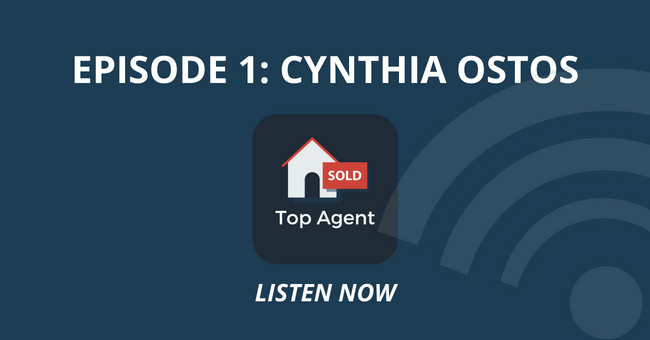 Subscribe to Top Agent Podcast on Apple, Google, and Stitcher or take a moment to read the transcript. Kosta: First off, thank you so much for taking the time to speak with me today. I really do appreciate that. Cynthia: You’re very welcome. I’m super excited. Kosta: Alright, so for those that don’t know who Cynthia says, please tell our audience just a bit about yourself, your background, and how you came to be a realtor. Cynthia: Well, I have been in real estate, this is my eighth year. Um, so in terms of background, like background professionally or personally? Kosta: Yeah, maybe professionally, personally, whatever, however you want to take it. Kosta: Amazing. Congratulations on all of that, by the way. I’ve known you since you pretty much started out as a realtor and, you know, around the same time. We started our company and, you know, you’ve definitely grown significantly since then, which is incredible to see. I genuinely love seeing people in businesses grow in general. That’s one of the reasons why I wanted to have you on and speak to you. So, as you mentioned, I see you’re leading a team now, which is fantastic. Um, one thing I’ve learned over the years is that hiring and growing a team is not easy. It’s truly a skill set that gets better with time and experience, which a lot of people don’t realize. And a question I hear often, especially from younger agents is whether they should join a team or not. So what made you form that decision to create a team and what do you look for in potential new team members? Cynthia: So, um, I mean we only have so much time, but basically, um, in terms of, you know, being a single agent and then, you know, deciding to build a team, it was basically, um, you know, my business in about three years ago, significantly changed from me, you know, selling real estate to thinking about it more of a business. And you know, when I started in real estate back in 2010, I was kind of, let’s say winging it, but doing very, very well because, you know, most agents, the average agent sells about six to eight homes a year. And for me off the bat, you know, I was doing more than that. My first, second, third, fourth, fifth year. I’m always doing more than that. Um, you know, about 20, 25 transactions a year on my own. And, when I actually joined Keller Williams, my mindset around real estate and business, it definitely shifted into, you know, there’s only so much I can do alone as a realtor. And I ended up bringing on an assistant and then that, you know, grew to adding a buyer agent. And now we also have a marketing and events coordinator because you know, you can only do so much on your own, right, like you can only wear so many hats and I just decided that, you know, I’m in this for the long haul and I want to provide amazing service to my clients and if I’m only one person, you know, it’s probably going to suffer at some point in terms of the service they received. So that’s kind of what brought me to, you know, decide to open a branch out into more of a business mindset and, and leading a team, which like you said, is not easy. That’s amazing. Kosta: That’s awesome. 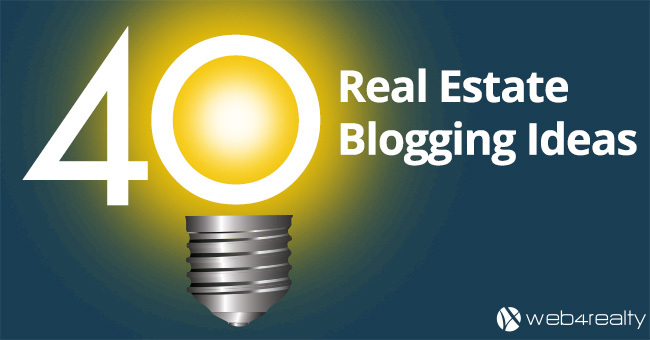 What are some of the biggest challenges that you currently face as a realtor? Whether individually or with your team, for example? Cynthia: Um, I mean, I think the challenge is, you know, in being a team leader and in real estate in general is just, there’s so much you can do. And I’m the type of person I am, I guess a bit of an entrepreneur mind innovator and I’m wanting to implement so many things. But you kind of have to, as many realtors know you’re, there’s that whole squirrel syndrome. So you’re looking here, looking there, you know, this is a great idea. That’s a great idea. Um, and then you’re seeing what other people are doing in your industry. So it’s like wanting to implement so many things. Um, I guess maybe in the back end, but then there’s the front end, right? Like there’s the transaction than actually showing homes and doing deals and you know, staying on target and um, you know, there’s, there’s just so much going on that it’s hard to sometimes be laser focus, which is really why they say, you know, do the one thing one thing at a time. Right. So that’s kind of a challenge that we find. Kosta: For sure. Yeah. Great insight for sure. Um, now one thing, you definitely have a very strong online presence, I mean not only with your website but on social media. So you have over 4,000 followers on facebook, another thousand plus on instagram. And these are really strong numbers for, for an individual realtor. So with that being said, what are some of your favorite and most effective marketing strategies that are giving you the most ROI that you can share with our audience? Cynthia: I mean, in terms of marketing, I think the one thing realtors kind of don’t capitalize on is the marketing you can do for your own listings, right? Or even buyers that you’re working with. So, um, something that’s been really great for us and keeping us kind of top of mind is every time we have a listing we use that as, you know, how can we market this to the Max, right? So in terms of marketing a coming soon, um, in terms of adjust listed our open houses, like we make sure that we’re top of mind and our listings are top of mind because that’s number one in terms of like where can you mark it and what are you marketing, right? So we try and maximize that and our sellers really appreciate that as well because we don’t just take a listing and forget about it. We’re really trying to push that on all of our social media channels. So I’d say that’s kind of like our number one in terms of marketing. Kosta: Yeah. So you’re doing a great job of that with, especially with the listing videos, which is great. I think video content nowadays is becoming a major importance in any social strategy. Cynthia: It totally is. It’s huge. And I mean we try and do those videos every time we can just to obviously promote the home but have content and um, you know, it’s really challenging nowadays with all these different, you know, places you could be the different platforms. Um, even instagram now has instagram tv, so it’s just endless. But video is where it’s at. Kosta: Yeah, absolutely. Um, so, you know, you started, you said back in 2010, so this was, you know, you’ve probably seen a big shift, especially in technology, um, now with social media and video and everything technologically related. So how do you see technology in general changing real estate in the next, let’s say five to 10 years? Cynthia: That’s a great question. I think that, um, you know, especially when it comes to following up with leads, um, I just went to an amazing conference called lab coat agents in the states. It was in San Diego and Cornado island and they talked about, you know, leverage is the new hustle, right? So how can you use like automated or AI type of platforms to kind of follow up with leads and you know, that’s kind of, you know, the, the, you know, if you’re not following up with your leads, I mean, that’s, that’s where the money is, right? So how do you as a busy realtor keep in touch with all of these people? So things like that. Um, it’s huge. They talked a lot about that and obviously video, um, you know, being, sending more video messages to your clients. Um, you know, there’s a lot of information online nowadays, but I think as much as you know, I sometimes wonder, you know, will realtors be around in 10 years. I still think we will be. But, you know, um, in terms of there being more and more information online, you have to obviously find more value to give the client besides what’s online, right? So that, um, you know, being on top of the latest trends and anything that you can find out about, you know, a property, let’s say that someone’s interested in that’s not publicly available, being on top of that because there is so much out there. Kosta: I love that. Leverage is the new hustle. That’s it. That’s a good one. I think I totally agree with you. I think it’s really important nowadays with new platforms and new mediums coming out just to be on top of it and at least try and test different things because you know, you never know what’s gonna work and what’s not gonna work until you actually do it. And that’s what a lot of people don’t do. Cynthia: Yeah. And I’ll tell you, um, we actually put a chat Bot on our website. I’m on the website that you host for us. And um, we were surprised and shocked, you know, there was someone typing to us and saying like, is this really Cynthia? And um, you know, I have the APP on my phone and I started chatting with this person and they were alive lead. They were, you know, someone that wanted to sell a home in Mississauga. So, um, you know, we’re going to be listing that property next week and it literally cost us millions. Kosta: Wow. That’s incredible. That’s incredible. Yeah. So I’m a numbers guy. I love hearing about revenue, commissions, all that fun stuff. I know you mentioned when you just started, Oh, you’re doing 20 to 25 transactions per year. Are you able to share how many transactions you plan on doing in the next 12 months or the last 12? Cynthia: So, um, when it was my first year of Keller Williams, I did about, let’s say 40 odd transactions myself and an admin. Um, so, you know, income wise was about like $300,000 last year we did when I brought on the buyer agent, she came on in March. So by the end of the year we did about 62 transactions, a handful of those leases. So, um, you know, that’s quite a bit of business and our goal this year was 100. We’re definitely having a bit of a tough year, you know, the market has really changed from last year in terms of, you know, balancing out and things taking longer to sell. So we might not hit our hundred transaction goal, which was I guess a bit aggressive, um, in terms of where we were last year, but we’re on pace to do at least what we did last year for sure. Kosta: I love it and that’s amazing. Congratulations. That’s awesome. Um, look, I want to be mindful of your time. I like to wrap up each interview with what I call the top three. Um, so number one, your top real estate or business book. Cynthia: Um, I mean there’s so many great books out there. I, I tend to start, I actually listened to a lot of, um, you know, audio books nowadays because, you know, reading, I’m just one of those types of people where I like to drive and listen to stuff that’s um, you know, mentally stimulating instead of, you know, listening to music, if I’m in the mood, of course you have to be in that right mindset to listen to content that’s business related, but the MRE book, I mean everybody, I’m sure mentioned that book. It’s the Bible of real estate. It really gets your mind around like, you know, running real estate, your real estate business as a business and what it takes to get to that seventh level or, you know, be out of production. So that would be my number one book if anybody’s interested in getting into real estate and running it like a real business. Kosta: Perfect. Perfect. Number two, your top vacation spot. Cynthia: I honestly have to say Hawaii. Um, I went there for my honeymoon and it, it just was the most peaceful, beautiful place and I would love to go back there. So yeah. Kosta: I agree. I actually went for my honeymoon as well, and it was one of those places for me where I wanted to check it off my bucket list, thought I probably wouldn’t go back again, but if I could, I definitely go back every year. Cynthia: It’s just a bit too far for us. So yeah. Kosta: Yeah. Beautiful spot. Number three, you got your license eight years ago on your 30th birthday, so you’re 38 years old. If you could go back 18 years, what do you wish your 20 year old self knew? Kosta: Amazing, good advice. And, if people want to get a hold of you or reach out, where can they find you? Cynthia: Yeah, by all means. I mean, our team is definitely growing and always looking for talent. Um, so you can check us out at cynthiaostos.com and we’re also on instagram and facebook. You can find us there. Kosta: Perfect. I’ll put all your details in the show notes by the way. And that’s pretty much it. Cynthia it was a real pleasure speaking with you. Nice catching up and we should definitely do this again. Cynthia: Thank you, Kosta. I really appreciate it. Take care. Have a good one. Take care. You too. Alright, bye. By the way, we’re providing exclusive promos to our listeners, visit web4realty.com/topagent and get your first month on us.